Backup via FTP with the help of SmartSync Pro. Backup via FTP is an essential way to save most important documents and data files which couldnТt be really safe on a local hard drive on in immediate proximity to your computer. To store backup offsite you can move storage media to remote location, but this is usually time consuming and often very inconvenient. The better way is to backup via FTP to server kept offsite. 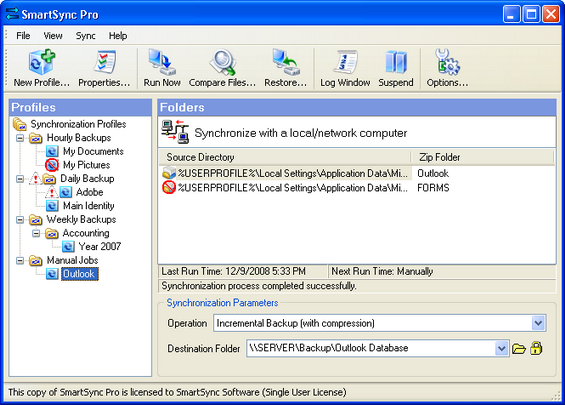 SmartSync Pro is an easy-to-use full-featured backup solution. It is generally used to backup and synchronize important data to the local drive, external drive, network volumes or remote computer. Step-by-step wizard-based interface will help you to set up backup profiles. Configuration of data to backup, backup destination and backup schedule can be made only once. Then scheduled tasks will perform all the backup work automatically. SmartSync Pro provides a unique feature. It allows synchronizing files and folders between computers that couldnТt be connected through local network. And transfers compressed data to remote computer using removable drive, email or FTP. Backup to FTP software has a flexible filtering system and enhanced scheduler. You will get email notifications of backup events if you want to. Additionally, it can be run as a service under Windows 2000/XP/Vista. Interface of the program is translated to 13 languages including Spanish, French, German and Chinese.